Platinum Pass! 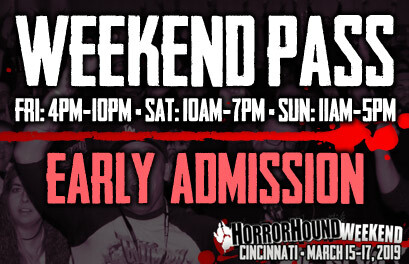 This ticket grants holder admission into HorrorHound Weekend during normal business hours ALL WEEKEND – March 15-17th, 2019 – PLUS one-hour early admission to the event Friday and Saturday! (Early Admission Hours: Friday: 4pm-10pm, Saturday: 10am-7pm, Sunday: 11am-5pm). Ticket grants admission into the convention center with access to the vendor, celebrity, tattoo room, Q&A panels, and the HorrorHound Film Fest. Platinum Line-cut pass – Platinum Pass Holder will receive a special line-cut pass which will be good for one line cut per EACH line-cut accessible guests (Including such guests as Christopher Lloyd, Meat Loaf, Doug Jones, Dylan McDermott, and others, yet to be announced). *Upwards of a dozen different line-cuts total! A special Platinum gift bag, loaded with surprise merchandise, gifts, and special offers! *Hotel reservation information (room confirmation number) will be emailed no later than two weeks prior to event. Hotel will be good for a two night stay (Friday-Sunday). Additional nights can be added at ticket-holders expense. Reservation name(s) can be changed once final reservation information is emailed to ticket buyer. **For Couples and Families: You can now use a drop-down menu on this ticket type to add on additional Platinum tickets (for your family or partner) at the additional cost of $300 per person. You can add on upwards of three additional Platinum tickets by using this drop down option. By using this drop-down option to add on to your order, you will still only receive only one hotel room and one parking pass. If you require more than one hotel room or one parking pass, you need to purchase multiple platinum packages at full price (without utilizing the add-on pulldown). ***While children 12 and under do not need to purchase a Platinum Pass to participate with a parent or legal guardian for the majority of perks, there is a chance that some perks may be limited to individuals 21 and over. This may apply to the Friday night after hour event, and the private party on Saturday evening – based on still-pending negotiations and contracts tied directly in with said-events. VIP Ticket! 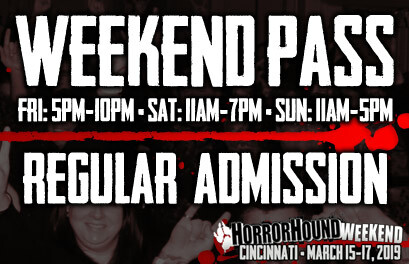 This ticket grants holder admission into HorrorHound Weekend during normal business hours ALL WEEKEND – March 15-17th, 2019 – PLUS one-hour early admission to the event Friday and Saturday! (Early Admission Hours: Friday: 4pm-10pm, Saturday: 10am-7pm, Sunday: 11am-5pm). Ticket grants admission into the convention center with access to the vendor, celebrity, tattoo room, Q&A panels, and the HorrorHound Film Fest. Line-cut pass – good for up to three line-cuts, based on a limited select number of VIP-optioned guests (Including such guests as Christopher Lloyd, Meat Loaf, Doug Jones, Dylan McDermott, and others, yet to be announced). Pre-Sale Tickets Sold-Out. Limited Tickets will be available at the door. 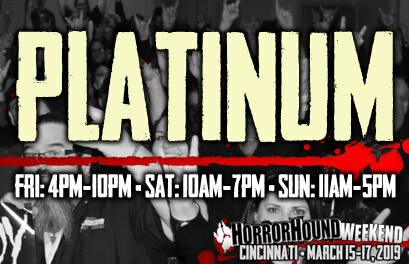 Admission into HorrorHound Weekend during normal business hours ALL WEEKEND – March 15-17th, 2019 – with one-hour early admission to the event Friday and Saturday! (Early Admission Hours: Friday: 4pm-10pm, Saturday: 10am-7pm, Sunday: 11am-5pm). Ticket grants admission into the convention center with access to the vendor, celebrity, tattoo room, Q&A panels, and the HorrorHound Film Fest. Admission into HorrorHound Weekend during normal business hours ALL WEEKEND – March 15-17th, 2019 (Hours: Friday: 5pm-10pm, Saturday: 11am-7pm, Sunday: 11am-5pm). Ticket grants admission into the convention center with access to the vendor, celebrity, tattoo room, Q&A panels, and the HorrorHound Film Fest. 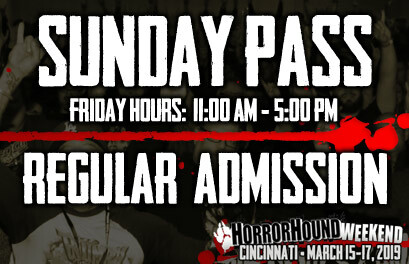 Admission into HorrorHound Weekend during normal business hours on SUNDAY, March 17th, 2019 (Hours: 11am-5pm). Ticket grants admission into the convention center with access to the vendor, celebrity, tattoo room, Q&A panels, and the HorrorHound Film Fest. 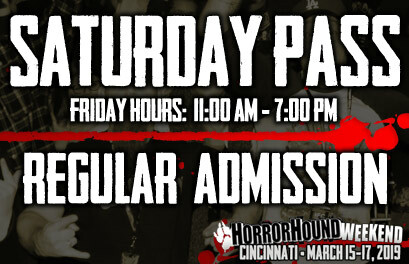 Admission into HorrorHound Weekend during normal business hours on SATURDAY, March 16th, 2019 (Hours: 11am-7pm). Ticket grants admission into the convention center with access to the vendor, celebrity, tattoo room, Q&A panels, and the HorrorHound Film Fest. 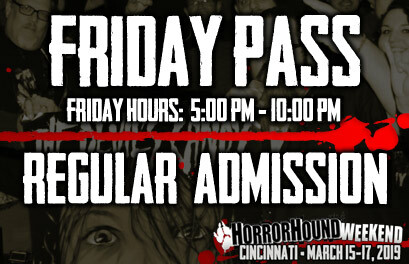 Admission into HorrorHound Weekend during normal business hours on FRIDAY, March 15th, 2019 (Hours: 5pm-10pm). Ticket grants admission into the convention center with access to the vendor, celebrity, tattoo room, Q&A panels, and the HorrorHound Film Fest.